Be a good patient and just do what the doctor tells you. For some reason, I’ve always believed that the doctor knows best. If the doc says to do something, I do it; the white coat and pretty diploma from the prestigious medical school, are indications that they know what they’re doing–at least more than I do. This kind of thinking is not uncommon, I’m sure. This month is Thyroid Disease Awareness Month. Thyroid diseases or dysfunctions are one of the fastest growing medical issues in the US, and apparently worldwide, if you pay attention to any news reports over the last year. I have not posted about thyroid stuff in several months and since there are only a few days left in the Awareness month, I thought it would be good to share something of my cancer journey. One of my major light-bulb moments lately while reading the volumes of posts on the Facebook page, is that I’ve got to ask my doc more questions than he’s asking me. I started a list of things I want to ask at my appointment in two weeks. I don’t think I’ll become a difficult patient, but I’ve learned that as my own health advocate, I have to do more than just what the doctor orders. In March it will be three years since my thyroid cancer diagnosis; and in May, three years since my surgery (known on the webpage as TT – complete thyroidectomy). My life in these few years has been a busy haze of working, grandchildren living with us, a lost business, bankruptcy, challenges at work; well, it’s been crazy. Only since joining the Facebook page have I really been able to come to some understanding of the fact that I am a cancer survivor. Today’s thank you is for all the Survivors on the Facebook page for sharing their failures and successes on their journey. It’s been so helpful to me. 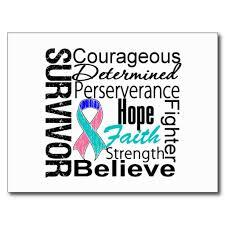 Carry on survivors and fight the good fight! Back at you, Donna. Keep up the great work!